I have been working on UAV project for the past several months. I built the model in Simulink using Cascade PID Control, which works pretty well in simulation. However, upon implementation, I am facing several problems. Primary with the derivative action. As seen in the video, the system is not really responding well. Therefore, I think I need to do a Cascade Control with one on the Angle Rate and another on the Angle. But to do that I need to calculate the error derivative, which is very noisy. So I need a derivative filter. 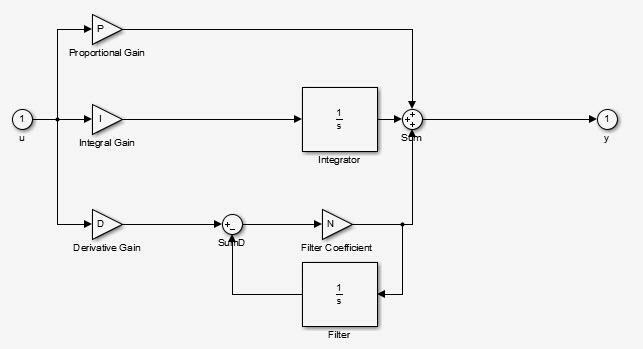 Here's the Simulink's PID Block. I don't really understand how the derivative term work since the derivative is never really calculated. Instead an integration term is used instead as part of the filter? But that don't really work at all. The Derivative term is very unstable and the quadcopter became uncontrollable. Can someone explain to me what I did wrong? As you say yourself, calculating pure derivative of a noisy signal is not a good idea. Transfer function of a pure derivative is s .
Here y is signal from "Filter Coefficient" block and x is the signal from derivative gain. So instead of transfer function s , Simulink implements s*N/(s+N) , which is close to s for low frequencies, but is then filtering out noise at higher frequencies. OH okay, now I see where that transfer function came from. So effectively, we are adding a pole to the derivative and changing the gain? I don't get how to write the code for -> s*N/(s+N), the block diagram format seems to make more sense intuitively. Anyway, isn't the code I posted and yours pretty much equivalent? Except I use non-constant sample time, trapezoidal rule for integration and doing the Filter_DSTATE before the FilterCoefficient.